View a Tyrannosaurus Rex print from up close and gain an appreciation of a long ago time when giant, prehistoric predators stalked the land. The T-Rex was the king of all dinosaurs, feared by all other creatures in the Cretaceous period. The land that he ruled was a humid landscape of tropical swamps and vast forests. This was long before man existed. A person would have been little more than a snack for the giant creatures living on the Earth over 65 million years ago. All of those details are conveyed on an art print, and a Tyrannosaurus Rex print shows the sheer scale and raw ferocity of the meat-eating T-Rex. Watch him seem to come to life with his head raised in a ravenous sniff for nearby prey. Look extremely closely, and it's possible to detect the detailed strokes of carefully applied paint that have been replicated visually on the high-quality print. The details around the dilated small eyes and the saliva dripping off of sharp, pointed rows of huge teeth can easily be made out. The medium of the art print ably shows every detail of scale and tooth in rich color. 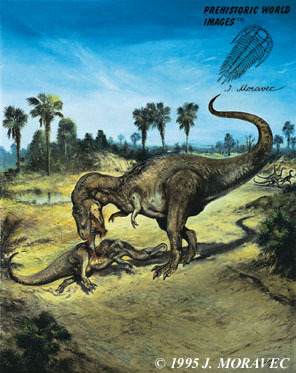 The artist, Josef Moravec, is a noted paleo-artist whose works have been displayed by Natural History Museums throughout Europe and North America. Art prints are not reproductions. They use superior techniques, often supervised by the artist, to create quality prints. They're not at all comparable with inferior posters or plain copies. In fact, many art prints are of a limited circulation and quite valuable themselves, becoming collector's pieces, hung on a wall with pride. Sometimes, they're even signed by the artist, becoming individual works of art. It's a combination of old printing technology and newer digital techniques that make a Tyrannosaurus Rex print look so startlingly authentic, right down to being able to see individual brush strokes. A print of the majestic T-Rex isn't only for lovers of all things prehistoric, it's also a reminder of a time when man could not have ruled the Earth. The print puts our place in life into perspective. We rule our orb through technology and by our wits, but our fists and muscle would have been no obstacle to any of the giant lizards of the Cretaceous period, and certainly not to the Tyrannosaurus who stood taller than a double decker bus. It's doubtful our fastest runner could escape him since he stood on two legs, able to run across the humid landscape in short bursts. He may have been over 40-ft tall, but his long tail gave him good balance and the ability to make quick turns. He was really the ultimate predator in his time, with a huge head containing many sharp teeth. His only weakness may have been his tiny arms, but they wouldn't have slowed him from reaching down and snapping up his prey in one smooth motion. Hang the art print of the T-Rex on a wall with pride and be reminded of the awesome place he held in prehistoric times. Just be glad he's extinct and only to be seen fossilized in museums.